Anna and Renee Miller-Yeaman’s art practice consists of an exchange between manipulated environments, sculptural objects and drawings. Their practice highlights and disrupts existing architectures both in the gallery and public space. Through injecting calculated objects and strange surface additions to selected structures, Anna and Renee’s installations operate with and against the logic of the site whilst alluding to alternative scenarios. 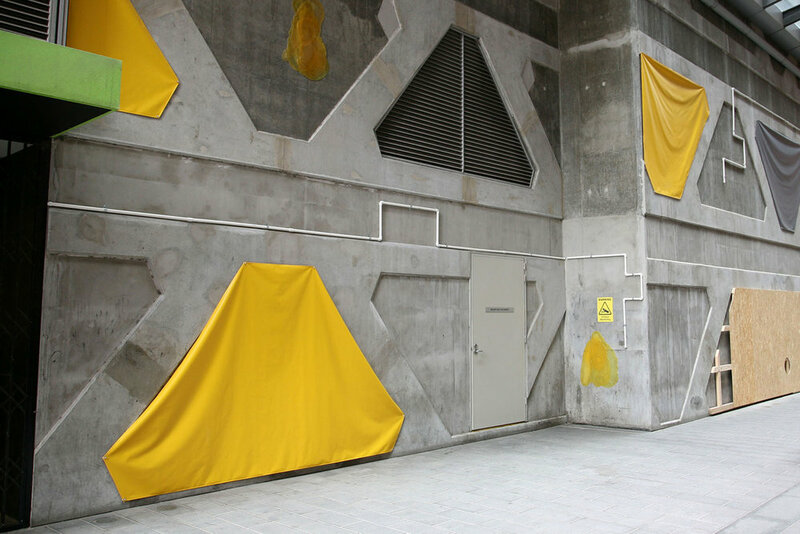 IMAGES | Anna & Renee Miller-Yeaman, Yellow Extractions, New Babylon Project, Next Wave, Artemis Lane, QV, Melbourne, 2012.| Images courtesy of the artist. Large construction sites get in the way. Dust and beeping trucks interrupt the street with routine commotion. Binding the site are provisional barriers plastered with images depicting future blue-sky excitement that can be bought now. Work is masked from view. Through gaps in this temporary fence, a passerby can see crude colours that yell out types: scaffold blue, orange flags and white cranes. Amongst alteration debris there exists rows of steel lattice, aluminium frames and concrete cards. Categorised into packs these replicated items wait to be made useful. Divorced from the context of a completed building, these material types are overlaid with ambiguities. Each object’s precise purpose is unclear: how will these parts operate together? A functional building necessitates that the strange material accumulation found on site will be covered, folded or jammed behind a clean surface. But what will be left on show to hint at the passing of this customary procession. Don’t throw the game away by covering a trick is an exploration into masking and declaring building features. This installation offers an extra layer to Gallery Two that embellishes and underplays both deliberate and incidental built arrangements. The additional surfaces and structures shadow or mimic existing characteristics from the rectangular windows to the temporary black plastic separating the exhibition space from the storage cupboard. This installation is an inversion of traditional interior claddings, rather than concealing and unifying, the new additions invite a closer look at the room’s inconsistencies. Using materials and colours borrowed from the construction site the work explores the subtleties present in items produced for singular purposes. Materials manufactured with standardised and coded colours such as safety orange and water blue are used to demark and react against the strange and accidental ornamentation found in Gallery Two.